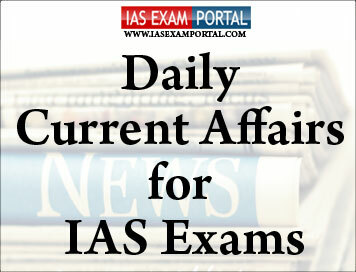 Current Affairs for IAS Exams - 12 FEBRUARY 2019 | IAS EXAM PORTAL - India's Largest Community for UPSC Exam Aspirants. Prime Minister NarendraModi today assured the people of Assam and the North East that the Citizenship Amendment Bill will in no way cause harm to their interest. Mr Modi was addressing a public rally at Changsari in Assam. He said, citizenship will be only granted after due investigation and recommendation of the state governments. The Prime Minister asserted that his government is committed to provide shelter to those who are minorities in neighbouring countries and had to leave due to the atrocities inflicted on them. Mr Modi also said, the NDA government is committed to implement the 36-year old Assam Accord within the stipulated time. He said, he would not allow anyone to destroy Assam for vote bank politics and only his government would fulfill the Assam Accord. The Prime Minister also said, steps are being taken to grant ST status to 6 communities of the state. He added that his government is committed to make Assam the oil and gas hub of the country and in the last four years projects worth 14,000 crore rupees have been completed. Mr Modi also laid foundation stones of several projects, including a six lane and 1600 meter long bridge over the Brahmaputra connecting Guwahati to North Guwahati. He also laid foundation stone of North East Gas Grid which will ensure uninterrupted availability of natural gas across the region and boost industrial growth. The data was tabled by the Ministry of Women and Child Development in the LokSabha on February 8, in response to a question by members TejPratap Sigh Yadav, L.R. ShivarameGowda and AnjuBala. PrajaktaKulkarni, a member of the Central Adoption Resource Authority (CARA), said there was little doubt that more girls were being adopted and it reflected that gender bias and the attitude of people against the girl child are changing across the country. SindhuNaik, member, Adoption Scrutiny Committee, State Council of Child Welfare (Karnataka), said that one has to also look whether more girls were coming for adoption. Ms.Naik said that the urban middle class people were preferring female children because they are concerned and aware of the situation of the girl child. The situation may not be the same for villages and small towns, she said. Markets regulator Securities and Exchange Board of India (SEBI) is looking into allegations and counter-allegations related to the sale of pledged shares of the Anil Ambani-led Reliance Group’s three listed firms by two lenders, senior officials said on Monday. L&T Finance and Edelweiss Group have refuted the allegations and have counter-alleged that Reliance Group failed to make timely payments, which, they said, necessitated the sale of pledged shares. Officials said the regulator had asked the exchanges to look into the trade details and seek clarifications from the entities concerned regarding open market sale of shares to ascertain whether any norms were breached in the process. The regulator would subsequently examine whether there was any violation of regulations relating to insider trading and disclosure norms, the officials said. The Minister of State for Road Transport, Shipping and Chemical & Fertilizers ShriMansukhMandaviya in a written reply to a question in RajyaSabha today informed that in order to promote the electric vehicle sector, the Government has notified for retro-fitment of hybrid electric system or electric kit to vehicles and has specified the type approval procedure of electric hybrid vehicles. A policy on charging infrastructure has been issued by Ministry of Power which clarifies that charging electric vehicles will be a service, not a sale of electricity. Further to combat increasing air pollution in Delhi, Ministry of Finance has issued advisory to all Ministries/ Departments that they may aim to replace all petrol/diesel hired cars in their offices by electric cars. Further, Ministry of Housing and Urban Affairs has made an amendment in the Urban and Regional Development Plans Formulation and Implementation (URDPFI) guidelines to provide for electric vehicle charging stations in private and commercial buildings. United Nations Secretary-General Antonio Guterres has renewed his offer to help broker an end to the crisis in Venezuela during talks with Venezuela Foreign Minister,JorgeArreaza in New York yesterday as the standoff between President Nicolas Maduro and opposition leader Juan Guaido hardened. The United Nations has called for serious political negotiations between the two sides to prevent a slide towards more violence in the South American country. Guaido declared himself interim president last month and has since been recognised by some 50 countries including the United States. Russia and China, however, continue to back Maduro as do some African countries, creating a global split that has left the UN in a quandary. Venezuela is in the midst of a disastrous economic crisis marked by hyperinflation, recession and dire shortages of food and medicines. The opposition blames Maduro for the meltdown, accusing him of corruption and of rigging elections to stay in power. Researchers from Mahatma Gandhi University, Kerala have identified a native roadside plant that can take up lead from the soil and thus help in removing the metal from the environment. The plant was found to accumulate lead at about 12,000 microgram/g of dry weight in the root and 7,000 microgram/g of dry weight in its shoot. Among the hundreds of native plants screened, research done earlier by the group shortlisted three plants. The present study found that Ecliptaprostrata had the highest lead tolerance. Hi-tech microscopic analysis showed that the lead travelled to the leaves and was deposited as lead nanoparticles in its cell wall, cytoplasm, and chloroplast. Though we noticed a little distortion in the structure of these organelles no toxicity was seen,” explains Chandana Chandrasekhar, a scientist. This study has provided evidence that the plant is a lead hyperaccumulator that has the suitable biochemical machinery. But as the present experiment was carried out using a soluble salt of lead (lead nitrate), more studies are needed in contaminated environments where lead is usually found in insoluble forms. Such experiments using naturally contaminated soils are significant further steps in using the plant for bioremediation of lead-contaminated soil.